It is time to take the work and vision of OCC to the next level, and I agree with Dr. Chen that we can change the world one child at a time. The vision is bright at the OCC and our path is clear. 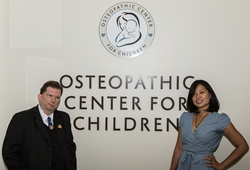 The Osteopathic Center for Children (OCC), a California public-benefit corporation, today announced the addition of a new physician, Ching Chen, DO. Founded, in 1982 by heralded osteopath Viola M. Frymann, DO, the Osteopathic Center for Children is world-renowned for treating children with complex neurological and other conditions and is as an internationally recognized teaching center for physicians. Escaping Communist China as a child during the last years of the Cultural Revolution, Chen went to medical school after her aging grandmother was denied healthcare and specialized in physical medicine and rehabilitation after she became outraged by the poor treatment of returning American combat soldiers. Chen likes to say she was “made in China” but born in America. As a youth having firsthand knowledge of China’s Cultural Revolution, which included persecution of free thinkers and dissidents, Chen felt the pain of the students at Tiananmen Square. As an adult, she developed a passion about the fundamental aspects of democracy she missed as a child. These include the power of freedom of thought and the pursuit of happiness. Chen, who is an internationally known expert in osteopathic manipulation and board certified in physical medicine and rehabilitation, has extensive experience working with complex medical conditions such as cerebral palsy, traumatic brain injury, autism, and pediatric Lyme disease. She uses a unique skillset to serve patients, which includes traditional Chinese medicine, herbal medicine, rehabilitative nutrition, and osteopathic medicine. Osteopathic medicine focuses on addressing the structural imbalances in the muscles and connective tissue, including the brain and spinal cord. Using osteopathic medicine in conjunction with proper nutrition, traditional Chinese medicine, and an energetic approach called Access Bars, Dr. Chen has been able to achieve outstanding results in both children and adults.